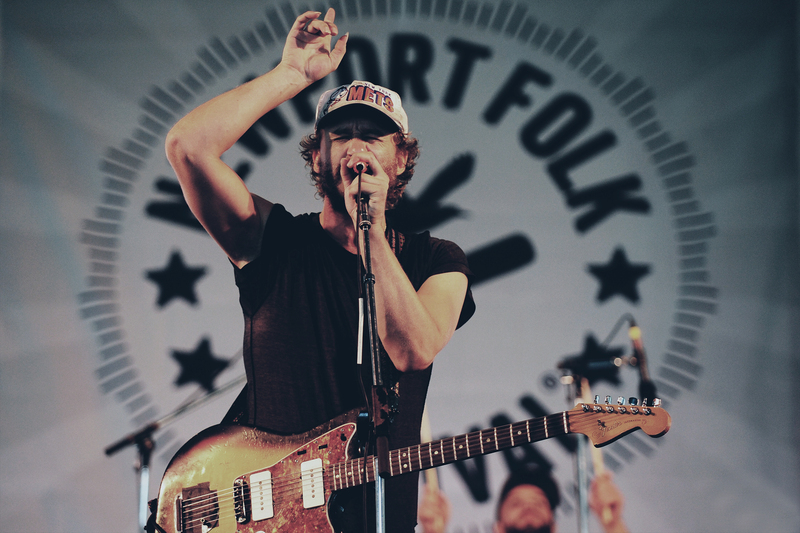 The newly extended Newport Folk Festival kicked off this afternoon with a near-full day of music. Unlike Saturday and Sunday, Friday wasn’t sold out, but the lineup was just as impressive. While the rain put a bit of a damper on the energy of the festivities, the access to music today was unmatched in the four years I’ve been coming. AND, the press and artist lounge was more badass than ever before with the good folks from Duxbury, MA’s Island Creek Oysters and MailChimp’s Monkey Bar taking good care of us. The Last Bison’s set was so intense that the band broke multiple strings in its first two songs. Blake Mills drew in a massive crowd, which included the likes of Bob Boilen and Phosphorescent. Mills was backed by Dawes for much of his set that featured one jaw dropping guitar solo after another and some nice harmonies with Taylor Goldsmith. The Low Anthem closed out Newport Homegrown – a special group of local acts – with a set of their own, showcasing a few of their heavier Americana songs for an album to be released later this year. Even amid some of the heaviest showers of the day, Phosphorescent drew one of the largest crowds of and (despite our wonder) performed with full electronic backing on hits like “Song for Zula.” While Deer Tick’s last album was dominated by heavy electric Americana tunes, festivarians got to see John McCauley perform as the stellar solo troubadour that he is (and with a fresh haircut). Old Crow Medicine Show closed out the day on the Fort stage shortly after a short performance in the Sennheiser Sound Lounge at the Paste Ruins. The forecast and lineup for Saturday is looking like it will be an epic day. Stay tuned. More photos from today and the entire weekend to come.